My inspiration came from the pastoral intern at my church who wore a simple thin ribbed knit scarf and refused to take it off inside the 108 year old building with intermittent heat. I thought this would look smashing on her and as an indoor/outdoor piece. Also it’s one skein and not too difficult, my favorite recipe for gifts. 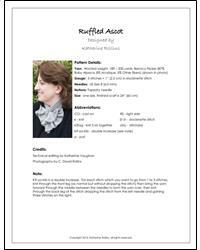 It is knit flat and the double increase for the ruffle is explained in the notes. Yarn: Worsted weight, 189 – 200 yards.